Probably there’s not a happier place for them than when I allow my chickens in the garden, but they can be destructive creatures, digging up seedlings and nibbling on things I might not be ready to share with them. On the other side of this coin: chickens can be a benefit to the garden with their own brand of fertilizer and love for crickets, grasshoppers and other leaf eating insects. I hate to deny my chickens things they love, but I must during peak production times in the garden. Chickens like to eat most everything in the garden, just like deer and rabbits. There’s not a happier place for me than down in the garden when veggies are ripe, especially sweet little tomatoes. I try to plant plenty of tomatoes and zucchini to share with my chickies, since those seem to be their favorites. I like the idea of people and animals having the best of “both worlds”…hmmm, chickens in the garden... When I run into a conflict like this I do some brainstorming, and I came up with an idea. 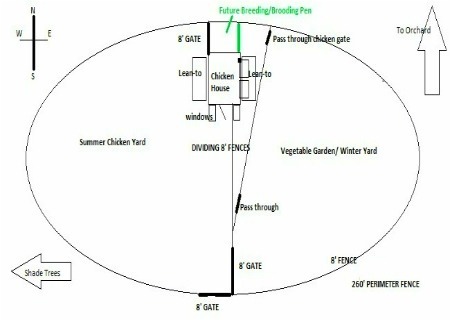 I’ve designed what I like to think is the perfect solution to having chickens in the garden. The same kind of fences that keep deer and rabbits out, keep chickens in or out. We built an 8’ high fence in an oval shape that’s about 260’ around. The chicken house is in the middle. We ran a dividing fence splitting the big yard in half and added a separate little side yard behind the chicken house on the garden side. We built three wide gates, big enough to drive the riding lawnmower through, because we have grassy chicken yards all year round for 20 or more chickens and no chickens in the garden. The West half of the yard gets the most sun, so that’s the vegetable garden area. The East half has some great shade from big Ever Greens starting about noon in the summer, so that’s the chicken’s summer yard. From the first frosts of fall until it’s time to plant the garden again I let my chickens in the vegetable garden side. This year they enjoyed a bounty of green, orange and a few red tomatoes still clinging to the frost bitten vines. They’ve scratched through my raised beds spreading their fertilizer and have good grasses to nibble where there was no planting. This way it’s safe and beneficial to have chickens in the garden. I keep them out of their summer yard to give it a rest from fall to spring. By the time I need my veggie garden back their yard has lush green tender spring grasses that grows well into the fall. We have 5 acres and I let them out to free range almost every day, which saves wear and tear on their yards. In the summer I hand water their yard with the hose, rinsing all droppings down below the surface which also fertilizes and protects grass from being burned up by the chicken’s high nitrogen droppings. I’d caution anyone about allowing chickens in the garden unsupervised. They won’t mean to, but can really destroy your crops. The solution I worked out is just past its first year, and so far works great. With the chickens right next to the garden I can toss veggies over the fence for them and they come running. It’s my plan to always plant way more than the house needs, so we have plenty of fresh organic veggies for the chicken house, too. Not everyone that has chickens has a vegetable garden. Some might have flower gardens and a mix of plantings, including herb gardens. 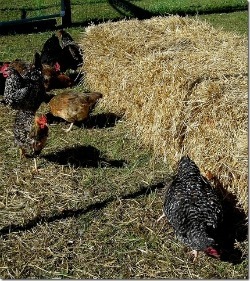 It’s the nature of chickens to scratch the ground in search of seeds, bugs, roots and other edible things. They also love to take dust baths and can dig quite a dust bowl in the ground, sometimes 10” deep. The digging and scratching done by chickens can expose roots and kill plants. Having chickens in the garden, if there are plants that you care about, is not something I would recommend. I’ve had dogs and puppies that dug up and ate plants in the yard, parrots and kittens that have destroyed plants in the house, sheep and goats that have eaten rose bushes to the ground; just doing what comes naturally to them. Chickens can be counted on to be destructive in the same unintentional way. It’s been said that good fences make good neighbors. Often our closest neighbors are the animals that live on our property. Good fences not only protect areas where you don’t want animals, but can help keep animals safe and prevent damage chickens might do to a next door neighbor’s yard. Chickens in the garden, yours or the neighbor’s can be a problem. I’m thinking of fencing a little area in the summer chicken yard and planting a variety of things like: sunflower seeds, safflower seeds, corn, tomatoes, and zucchini, just so my chickies can enjoy their own garden all summer.